Recently seen performing LIVE on Channel 4, over the last 14 years Martin has performed over two THOUSAND shows as a Professional Close-up London Wedding Magician at wedding drinks receptions & wedding evening receptions throughout the UK, in over 50 countries, as a 5 year Resident Close-up Magician in Spain and on over 100 Cruise Ships! This vast experience has dubbed Martin as one of the most experienced professional London based Wedding Magicians in the UK today! 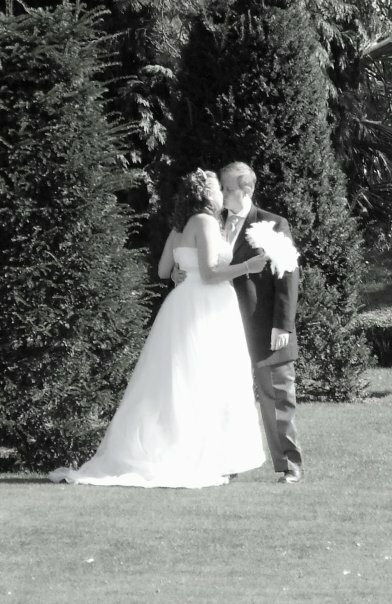 Why should you book an up close Magician for your wedding drinks reception? Firstly by watching the video above you will see just how entertaining and memorable Close-up Magic can be, especially for your wedding! The wedding drinks reception in particular is a great time to have Martin strolling from group to group as it is at this point where the bride and groom are usually busy having photographs taken, therefore the guests are often socialising with many people who they have never met before. Whether it be the different sides of the family meeting for the first time or friends of the family, Martin will bring everyone together creating the perfect ice-breaker with his entertaining magic routines. 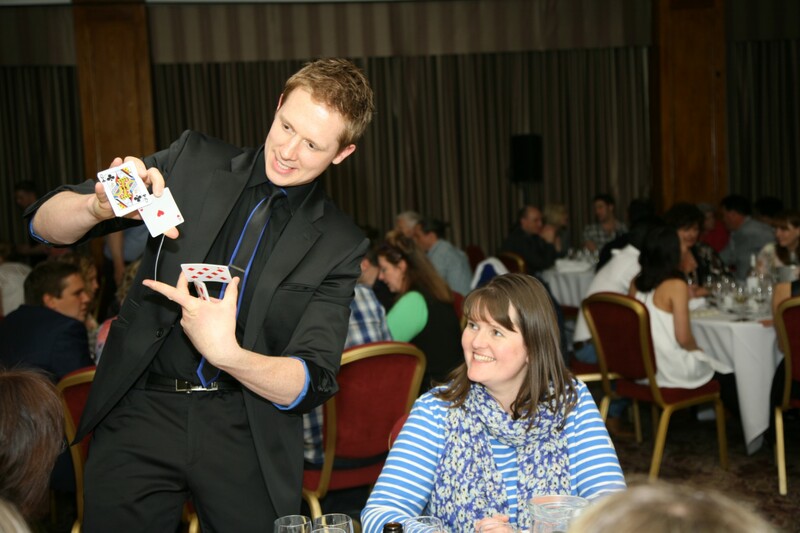 Martin will approach each group performing professional sleight of hand magic tricks & routines with cards, coins that fall upwards, ropes, sponge rabbits (a favourite for women & children), bank notes and even borrowed and everyday objects! Signed cards appear in Martin’s pockets, impossibly into his ‘flaming’ wallet and even magically change in the spectators hands (fire wallet routine is optional and 99.999% of venues have had no issues with Martin’s routine). Martin also performs as a Wedding Table Magician. 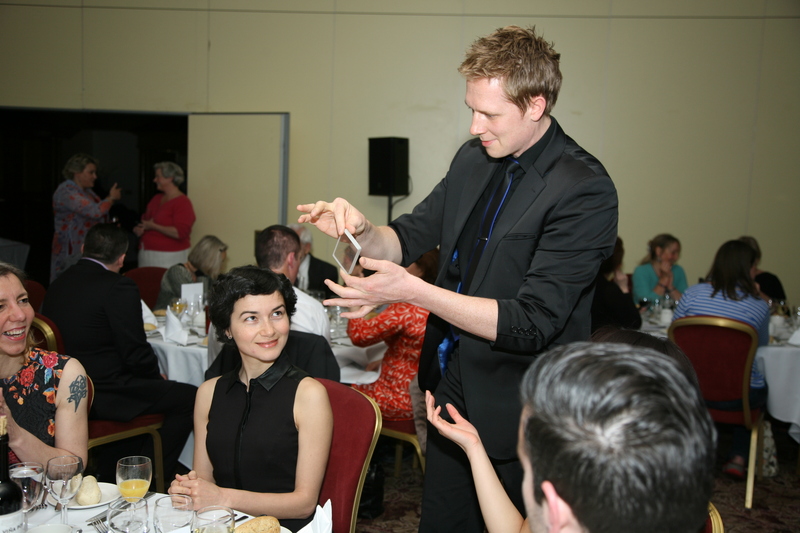 Table Magic is often used at the wedding breakfast or evening reception. Martin will approach each table performing specially designed routines to be seen by all at any size table. How does this kind of magic work as people at the tables will be eating? Don’t worry…Martin performs table to table in between courses, creating a fantastic atmosphere at each table. Will he get in the way of the waiters?! As the 5 year resident at a dinner & dance show venue performing over two thousand shows, Martin has more than enough experience to work in any situation. If a waiter approaches the table ‘mid-routine’, Martin actually includes them in the routine! You can be assured of a comfortable, professional approach at every table…exactly what should be expected for your wedding. How long will Martin perform at each group? Depending on the amount of people at the event, Martin’s average time spent performing to each group is approximately five to seven minutes. This however is completely flexible. If you have a large wedding Martin can perform shorter but equally as effective routines. For small weddings, Martin can perform up to two different 10 minute routines to repeat groups, so anything can be covered. Martin will also of course perform a special set to the Bride & Grooms table! If your wedding has literally hundreds of people attending, Martin can either recommend another Professional Close-up Magician to work alongside him, or can also offer his Comedy Stage Magic Act which he has performed to audiences up to 4000! Close-up Magic is the perfect ice-breaker for wedding drinks / cocktail receptions, parties & corporate events. Any event where people are in a small group is perfect for Close-up Magic! What other event types is Close-up Magic suitable for? Close-Up Magic is suitable for a wide variety of events, including but not limited to: Birthday Parties, Private Parties, Corporate Events, Cocktail Receptions, Christenings, Product Launches, Trade Shows, Christmas Party Events, Bar Mitzvah, Bat Mitzvah, Gala Dinners, Jewish Weddings, After Dinner Entertainment. You’ve seen it on the television…now it’s time to have your mind read for real. Watch in disbelief as Martin guesses a colour that you are merely thinking of…over and over again! Still not convinced? Think of a time. A time that relates to a very important event in your life, perhaps the time that your child was born for example. How could Martin possibly have predicted this EXACT time? At the age of 21, Martin flew to Spain attempting to make a living as a Close-up Magician performing his close-up act in bars for tips. After two months of performing seven nights per week he had been noticed by the management of the largest variety show venue in Spain, the prestigious 2000 seater Benidorm Palace. He then became the resident magician for five years performing close-up magic on spotlight, table to table in front of audiences of over 1000 nightly! Being presented with multi-lingual audiences, Martin learnt his show in Spanish & French. Over the five year period performing 5 nights per week, Martin gained a huge amount of experience as a Close-up Table Magician, performing over 1000 shows. Exactly what we wanted for our wedding! Stage magic & close-up around the tables/outside on the balcony was amazing, we all had a great night! Thanks again Martin. Exactly What We Wanted For Our Wedding!